The Essential Kitchen Bathroom Bedroomis a pioneer magazine in its genre. It is one of the most trusted magazines on interior design and architecture. 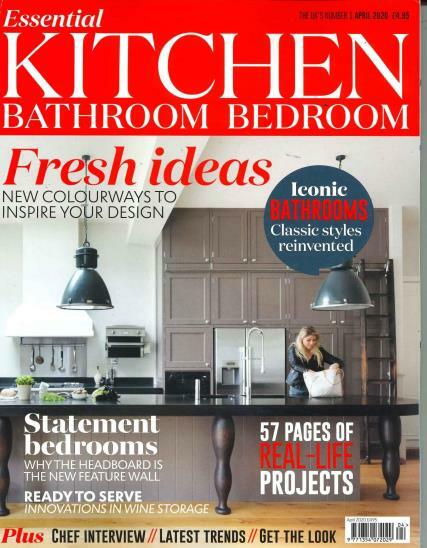 Buy a single copy or subscription to Essential Kitchen Bathroom and Bedroom magazine. It is one of the most trusted magazines on interior design and architecture. The magazine has several columns by the experts in the field of interior decoration which can help you get an in-depth analysis of the designs yourself. The magazine runs separate sections on kitchens, bedrooms and bathrooms. The high definition pictures and the intricate details of the fittings and the fixture’s make and the dimensions help you in understanding the design much better. It also gives an approximate figure of expenditure to be incurred in revamping your living spaces according to the designs featured in the magazine. In the magazine’s pages you will find a perfect blend of rustic style designing with the contemporary styles. The magazine also provides you with the extravagant styles suited to your needs. You will find that the designs are neither underrated nor over the top which leave you dissatisfied often. It also does a section on the materials to be used and does a neat comparative analysis of the furniture, fixtures and fittings provide by the various brands. There are contests which can help you win several deals on furnishings as well as a grand prize of revamping your house.